Organic Facial Wash ($22/4oz) – contains organic grapes and apple juices, sunflower oil, essential fatty acids, honey and helichrysum (for its anti-bacterial and anti-acne properties) and carrot seed. It has a strong, but delightful, herb smell. If you are sensitive to some ingredients, do a spot test before using this one. Remember, natural or organic products can be a little more harsh than what you are used to. Organic Facial Moisture Concentrate ($36/1oz) - concentrating the ingredients of organic cranberry, grapeseed, sunflower and jojoba oils give skin a boost of these ingredients’ benefits. 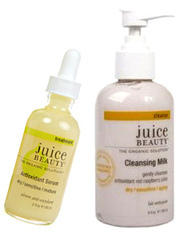 Both @ juicebeauty.com. Even if JUICE BEAUTY skincare wasn’t 95% certified organic or an extremely effective full service skincare line, I would go back to it time and time again just for the delicious fragrances of the products! Make a special note of the soap-free Cleansing Milk ($22/6oz). Rich raspberry and white grape juice mixed with soothing Aloe vera and vitamins melt makeup off and gently cleanse. My next nose/skin pick is the Antioxidant Serum ($45/2oz). It has a powerful blend of natural vitamin antioxidants to rejuvenate, help smooth fine lines and firm your skin. You can use it morning and night. Their Green Apple Peel Sensitive ($39/2oz) gently exfoliates and brightens your skin with a hydroxy acid complex of certified organic apple, lemon, grape juices and raw cane sugar (excellent for sensitive skin!). MMMM yummy. Who thinks of lips when it comes to protecting them from the sun? Greece’s APIVITA did with their collection of Lip Aids ($7 @ apivita.com) from the Propoline collection. There are six balms and three contain an SPF 15 and lip skin nourishing ingredients like plant extracts, olive oil, essential oils and a base of cocoa butter. Need some color with that protection? JUICE BEAUTY Organic SPF 15 Tinted Lip Moisturizers ($15 @ juicebeauty.com). Each is tinted using minerals and certified organic emollient plant oils and botanicals keep lips soft and hydrated.